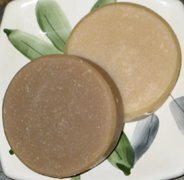 Basic Homemade Soap Recipe and Soap Making Instructions! This homemade soap recipe shares soap making tips, soap making supplies and soap making instructions. - Measure ALL ingredients by weight. - DO NOT substitute oils! Use ONLY specific ingredients to your recipe! - CAUTION! Before making homemade soap HEED ALL WARNINGS! You'll be making homemade soap, at your own risk. Understand all ingredients, procedures and safety precautions before starting. 1 - DRESS APPROPRIATELY: Wear rubber gloves, safety goggles, protective clothing and shoes. You will be handling lye. Lye can cause, extremely, painful burns if it contacts your skin. If you happen to get a lye burn, pour white vinegar on the burn to neutralize it. If you spill lye, wipe the entire area with generous amounts of white vinegar, making sure ALL lye is neutralized. 2 - UNDERSTAND ESSENTIAL OILS: Essential oils are potent with bioactive ingredients. Respect ALL essential oils & treat with care. Olive Oil – 24 oz. Coconut oil - 10 oz. Milk – 24 oz. / Pour goat milk into a shallow pan and freeze solid. Break goat milk into chunks before using. Soap making molds can be made of wood, plastic, hard shoebox material, etc.... Soap molds come in various shapes and sizes. Melt Lard and Coconut Oil in stainless steel stockpot. DO NOT heat ingredients above 115 degrees! Next, add Olive Oil. Add Lye into the milk and lye mixture in Pyrex or plastic containers. Keep an eye on the temperature. Make sure the lye/milk mixture does not get hotter than approx. 140 degrees, or else the milk will scorch. You DO NOT want your goat milk to scorch! If the milk has thawed, pour small amounts of lye in very slowly, waiting until the temperature goes below 90 degrees before each addition. Monitor temperature of the lye and oils. When they both reach a temperature of 90 to 100 degrees, you can go to the next step. Now is the time to add any additives into the mixture. Stir mixture well and quickly with an immersion blender. This type of blender saves hours of stirring with a spoon. It's well worth you time and money. Use it for all of your homemade soap recipes! STEP # 9: POUR MIXTURE into your soap molds. STEP # 10: REMOVE SOAP from molds after hardening. Cut soap into bars with a sharp butcher knife or soap cutter. Use a sharp cutter to cut through the thickness and depth of the soap. Soap cutters come in varieties, with straight or crinkled edges. Place soap bars on non-metallic surface to cure for 3 to 4 weeks. There are different types of drying/curing racks. After your homemade soap has completely cured it's ready to use! Find more soap recipes! Get started making goat milk soap! Goat milk soap contains natural vitamins A, B, C, D, E and K! Handmade experts confirm that goat milk is the key ingredient between a regular handmade soap and a luxury item! Avoid soaps with harsh, manufactured, ingredients!